現在位置: ホーム / フォーカス・オン / ディスプレイ / [Finetech Japan 2015] Mobile Display up to 700 ppi. How about OLED? 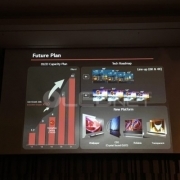 At Finetech Japan 2015 (April 6-8), vice president of LG Display, Yoon Sooyoung, forecast the display resolution would evolve to 700ppi UHD for differentiation in technology. 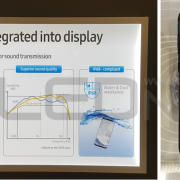 Japan Display’s CBO Yoshiyuki Tsukizaki also disclosed that a person can perceive up to 700ppi and estimated that mobile display resolution would therefore develop up to 700ppi. Currently mobile display is being mass produced at QHD (approx. 500ppi), and UHD resolution is known to being actively developed for LCD. It is analyzed that UHD mobile OLED panel development will be a necessity in order to adapt to the trend toward high resolution. OLED is being mass produced in RGB pixel structure where FMM (fine metal mask) is applied. However, as FMM production technology is difficult, QHD AMOLED panel is being mass produced via pentile pixel structure rather than real RBG pixel structure. Therefore, technology for realization of mobile UHD resolution is expected to be a key issue in future. For the mobile UHD AMOLED panel realization, securing shadow mask technology that allows for UHD resolution is important. In Finetech Japan 2015, V-Technology exhibited FHM (fine hybrid mask) technology that can produce 700ppi or higher resolution. V-Technology further revealed that “resolution of up to 738ppi can be produced using laser patterning technology after the formation of polyimide film on top of Ni mask”. Additionally, another method is where white OLED + color filter is applied which uses color filter patterning technology. This is a comparatively easier method for producing high resolution, and JDI is aiming for mass production using WRGB structure. Chinese latecomers are also examining application of white OLED + color filter structure for high resolution AMOLED panel production. The attention of the industry is now focused on how OLED will react and what solution will be generated facing LCD sector that is evolving toward UHD mobile display. http://jpn.olednet.com/wp-content/uploads/2015/04/150412_Finetech-Japan-2015-모바일용-display-700ppi까지-간다.-OLED는.png 469 625 OLEDNET http://jpn.olednet.com/wp-content/uploads/2015/09/logo_oled.png OLEDNET2015-04-13 15:42:132015-04-15 10:01:38[Finetech Japan 2015] Mobile Display up to 700 ppi. 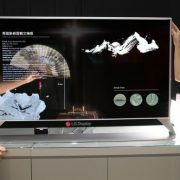 How about OLED? Prof. Changhee Lee of Seoul National University, ‘Anticipate QLED’s Fut... JOLED’s Intense Start, Mass Production is When?